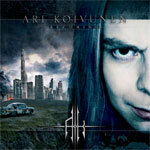 Koivunen�s voice sounds pretty standard for European power metal. It is a bit too high-pitched for my tastes, but not overly whiny as to make it unbearable. My main problem with this disc is the music. The opening track �Raging Machine� opens with an Evergrey sounding riff, but quickly becomes overly saturated with keyboards which seems to be a recurring theme on this CD. Even the heavier songs that have some crunching guitars like �Sweet Madness� and �Tears Keep Falling� quickly lose their luster when the synths start in. If Ari wants to make it globally as a metal singer, he�s going to have to toughen up both the vocals and the music. Make no mistake about it. What we have here is a pop album with some guitar playing that is slightly above average for that type of music. If you�re looking for a quality rock or metal album I�d recommend that you keep shopping. If I wasn�t writing this review I wouldn�t have made it all the way through �Becoming.� I honestly couldn�t wait for it to end. If you�re looking for a quality rock or metal album I�d recommend that you keep shopping. If I wasn�t writing this review I wouldn�t have made it all the way through �Becoming.� I honestly couldn�t wait for it to end.